This project shows how to use low cost 433MHz RF transmitter/receiver modules to build a 5-channel wireless RF remote control system using 2 x PIC12F1822 microcontrollers. In this 433MHz RF project data is transmitted from the transmitter circuit to the receiver circuit using NEC protocol. The NEC protocol uses pulse distance encoding of the bits. Each pulse is a 562.5µs long. The RF transmitter circuit schematic is shown below. In the circuit there 5 push buttons and each button sends a different RF signal code. The RF transmitter is the element that sends the RF signals to the RF receiver circuit. PIC12F1822 internal pull-ups are enabled by the software and the internal oscillator is used as usual. In the circuit there are 5 push buttons connected to RA0, RA1, RA2, RA3 and RA4 which means that pins must be configured as inputs and the RA5 pin as output. In the 433MHz RF receiver circuit there are 5 LEDs and an RF receiver. 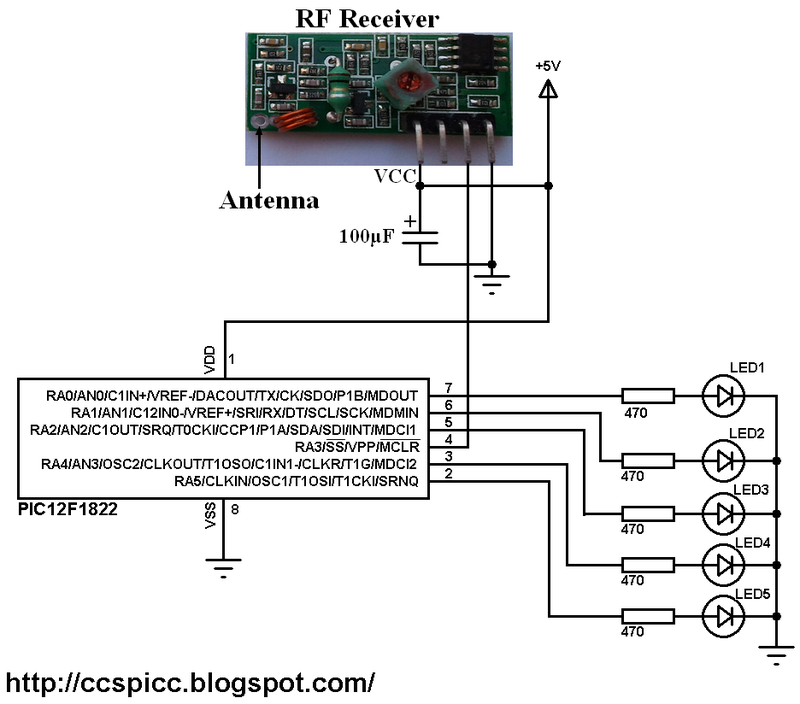 The RF receiver receives radio signals transmitted from the RF transmitter. Each LED is remotely controlled from one button in the transmitter circuit. PIC12F1822 internal oscillator is used and MCLR pin is configured as a digital input pin. 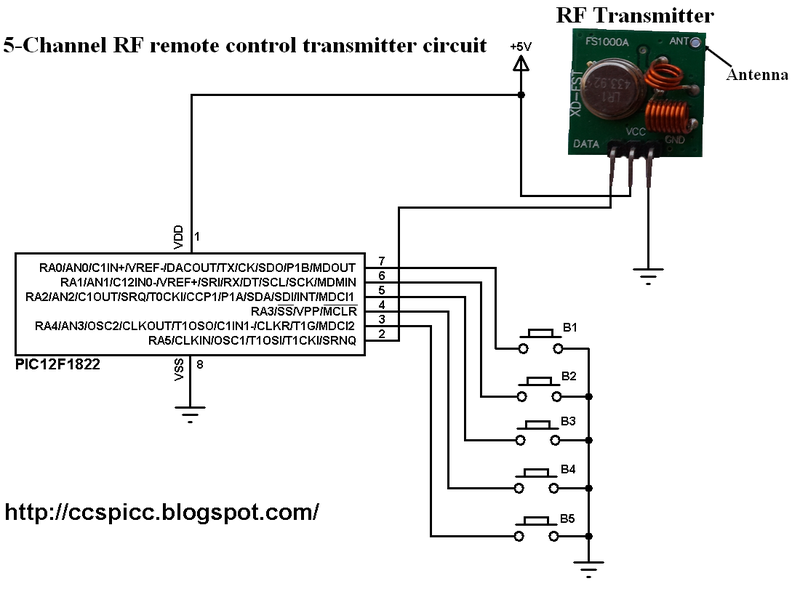 As in the RF transmitter the internal oscillator of the RF receiver microcontroller is used. Timer1 is configured to increment every 1us and it is used to measure pulses and spaces duration (@ 32MHz mcu frequency). This topic shows how to make a simple infrared (IR) remote control system using the microcontroller PIC12F1822. 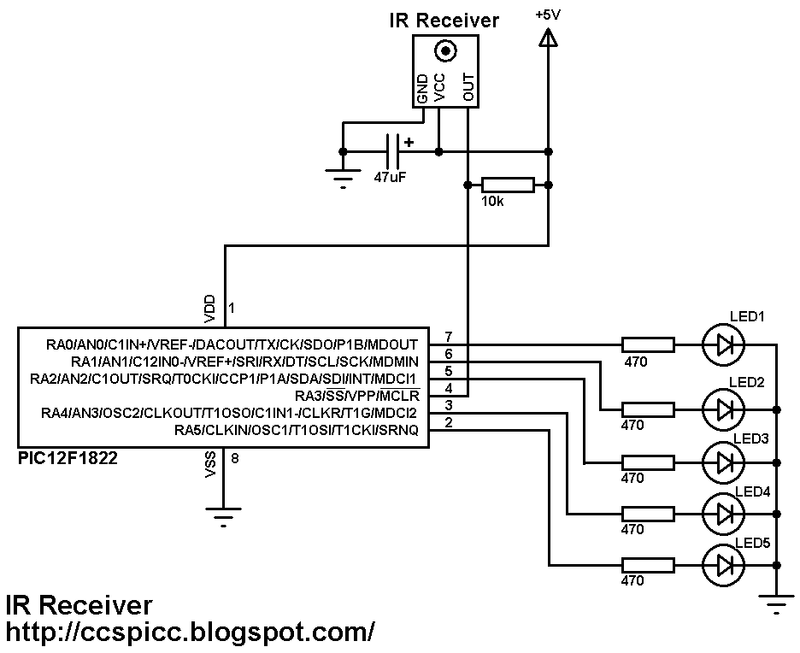 This IR system has two circuits as known: IR transmitter circuit and IR receiver circuit. Both circuit based on the same microcontroller type which is PIC12F1822. This IR system uses NEC communication protocol. To see how the NEC protocol works read the following topic which shows how to decode this communication protocol using PIC12F1822 microcontroller. 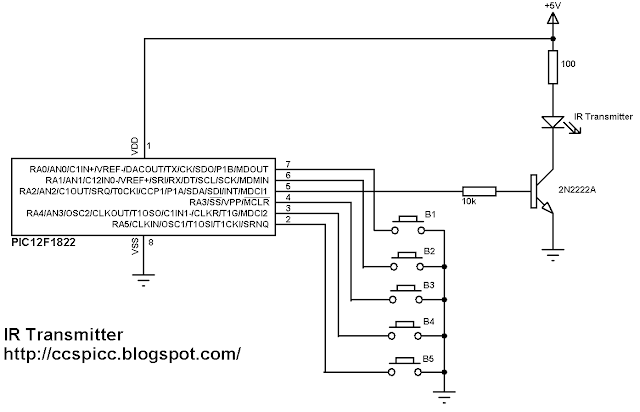 The following image shows the IR system transmitter circuit schematic diagram. In the circuit there 5 push buttons and each button sends a different IR signal code. The IR transmitter is the element that sends the IR signals to the IR receiver circuit. The NPN transistor 2N2222 is used to drive the IR transmitter because the IR transmitter consumes high current and the microcontroller generally can't provide that amount of current. 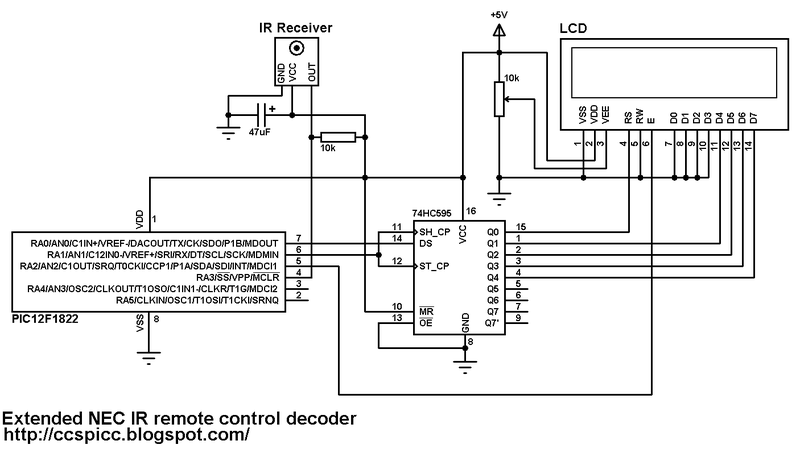 This is the full code of microcontroller of the NEC IR transmitter. In the circuit there are 5 push buttons connected to RA0, RA1, RA3, RA4 and RA5 which means that pins must be configured as inputs and the PWM pin as output. The NEC receiver circuit schematic is shown below. In the IR receiver circuit there are 5 LEDs and IR receiver. The IR receiver receives IR signals transmitted from the IR transmitter. Each LED is remotely controlled from one button in the transmitter circuit. As in the IR transmitter the internal oscillator of the IR receiver microcontroller is used. Timer1 is configured to increment every 1us and it is used to measure pulses spaces duration. The following video shows project final result. 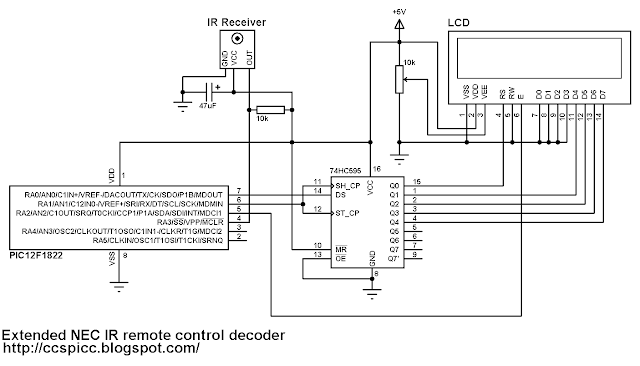 This topic shows how to decode IR remote control uses extended NEC communication protocol. In this project PIC12F1822 microcontroller internal oscillator is used and MCLR pin is configured to work as a digital input. 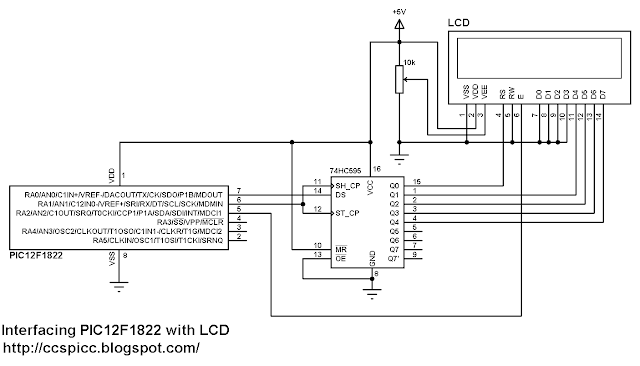 By adding the shift register we can make a low coast 3-wire LCD. A pull-up resistor (10KOhm) between VCC and the IR receiver output pin minimizes the noise on that pin. To see how to use 74HC164 or CD4094 instead of 74HC595 read the topic at the link above. Timer1 is used to measure pulses and spaces duration in us. The next 8 bits for command and the last 8 bits for the inverted command. Where IR_Sensor is the pin where the IR receiver output connected to. After that a function named nec_remote_read() is called, this function checks if the received signal has NEC protocol form all the time and reads the message code bits. The variable count is used to store Timer1 value. An interval between 8500us and 9500us is used to check the 9ms burst (9000us). The same thing is done for the 4.5ms space. The complete CCS C code for the NEC decoder is as the one below. Now let's see how to interface this microcontroller with DHT22 (AM2302) digital relative humidity and temperature sensor. In order to understand this example please read the DHT22 (AM2302) datasheet. PIC12F1822 microcontroller internal oscillator is used and MCLR pin function is disabled in the software. To see how to use 74HC164 or CD4094 instead of 74HC595 go to the link above. A pull-up resistor must be added between the sensor data pin and VCC (+5V) pin as shown in the circuit schematic (4.7K ~ 10K). Variables Time_out and k are used to test reading time to avoid wrong data reception and microcontroller hanging. The microcontroller runs with its internal oscillator at 32MHz (8MHz + PLL). In this blog there are some topics talking about the DHT11 relative humidity and temperature sensor and how to interface it with different types of PIC microcontrollers. 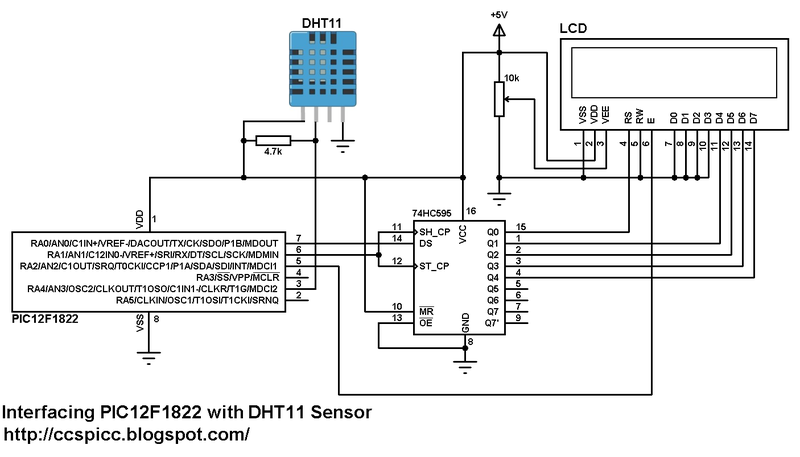 The datasheet of the DHT11 sensor shows its characteristics and how it works. 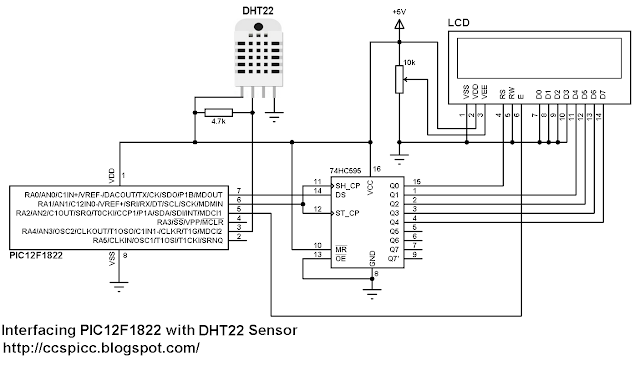 This topic shows how to interface this sensor with the microcontroller PIC12F1822. This microcontroller has only 8 pins and 6 of them can work as an I/O pins. Therefor for this simple project we need 3 data lines for the LCD and 1 line for the DHT11 sensor which means we need 4 I/O pins. The shift register data line is connected to RA0 pin and the clock line is connected to RA1 pin. LCDs enable pin is connected to pin RA3. The internal oscillator of the PIC12F1822 microcontroller is used. A pull-up resistor must be added between the DHT11 data pin and VCC (+5V) pin as shown in the circuit schematic (4.7K ~ 10K). If you want to understand the code please read the DHT11 datasheet. 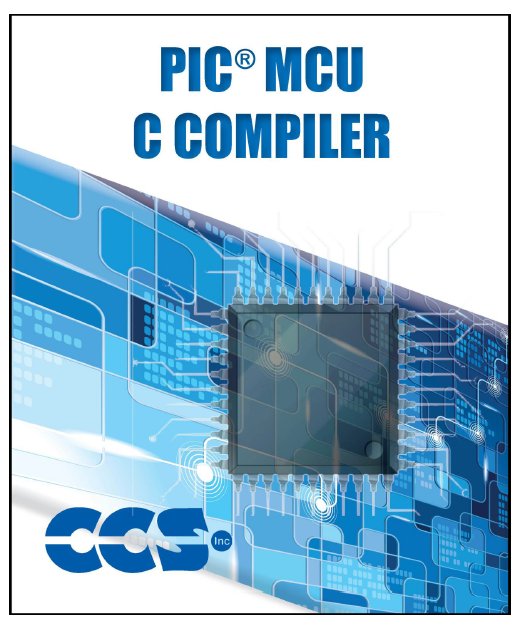 This topic shows how to interface the microcontroller PIC12F1822 with LCD display (1602, 2004 .....) using CCS C compiler. The microcontroller PIC12F1822 has only 8 pins and only 5 of them can be configured as outputs. The LCD display needs at least 6 data lines to operate and we can not connect it directly to PIC12F1822 microcontroller. Using a serial in parallel out shift register (74HC595, 74HC164, CD4094 ......) we can minimize the number of pins used by the LCD to 3. It is easy to add this driver to your project just download the C file and copy it to your project folder or to the CCS PIC C driver folder. To see how to use 74HC164 or CD4094 instead of 74HC595 see the 3-wire LCD driver topic at the link above. This is the full code of this example where the microcontroller runs with its internal oscillator at 32MHz. The code shows how to make only one line scrolling as shown in the video below. PIC18F4550 microcontroller has USB module which can work as a HID (Human Interface Device). The USB HID device doesn't need any additional driver because it's already installed in most of modern operating systems. 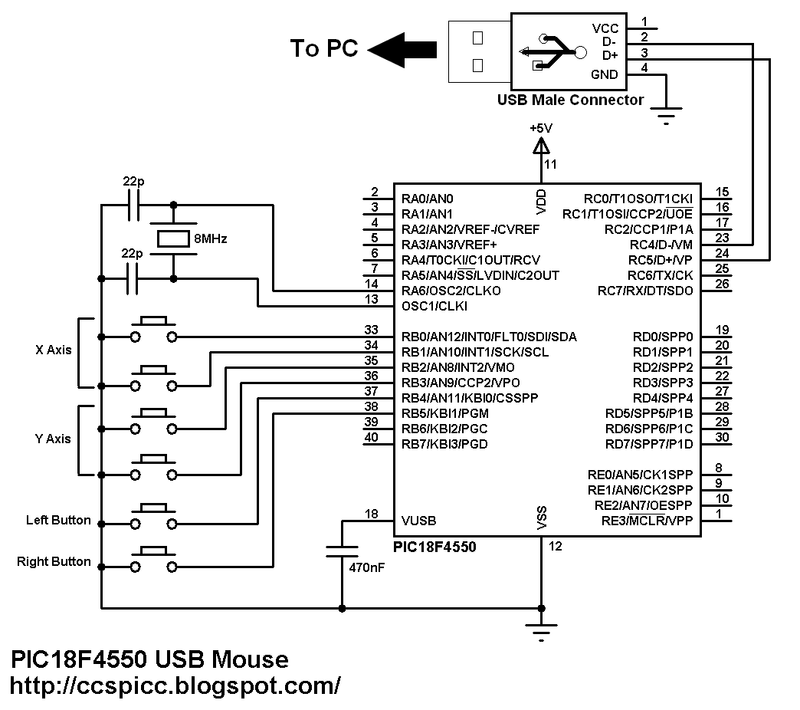 This topic shows how to build a simple USB HID mouse using PIC18F4550 microcontroller (PIC18F2550 can also be used). Byte 1 corresponds to button status. The left button of the mouse is represented by 0x01 and the right button is represented by 0x03. Byte 2 and byte 3 correspond to X axis and Y axis directions. This video shows a simple hardware circuit connected to PC where the screen is divided into two parts, the left part is a recorded video of the PC screen and the right side shows the hardware circuit.